Gluten-free sourdough bread and other wonderful baked goods are within reach! Use this Gluten-free Sourdough Starter today and enjoy gluten-free bread, rolls, muffins, and more! Each box contains 1 packet of dehydrated sourdough culture made from brown rice. The sourdough starter can be used repeatedly to make baked goods. One packet is all you need! Store in a cool, dry place until ready to activate the sourdough starter using rice flour and water. Manufactured in a facility that also processes products containing soy and dairy. Gluten-Free, Vegan, Non-GMO. Activate using brown rice flour and unchlorinated, unfluoridated water. Shelf life: Room temperature: 12 months, refrigeration: 12+ months. Dehydrated Sourdough Starter Culture made from brown rice. 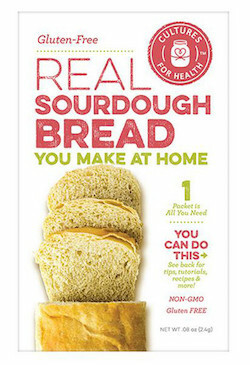 Ingredients: Organic brown rice flour, live active cultures. Cultures at room temperature at 70-85ºF. Each box contains 1 packet of starter culture.